I am really excited about this joint effort with my friend Fernan. He is a martial arts instructor that has written many books himself. He knows self defense! When he approached me about this project I immediately got excited. In a world of conflict we offer the first in this series to prepare anyone for the many scenarios of life. It is the right blend of self defense, survival skills and positive philosophy. Order your copy today! “Pressley and Vargas have provided an excellent tool for getting back to our basics, for re-discovering the complexity and totality of survival. 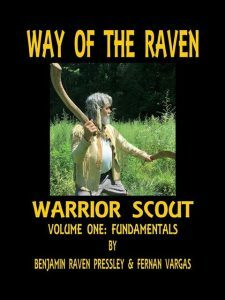 In Volume One of the Warrior Scout series, they address all the basic skills that everyone should know — water, food, navigation, etc. But they do so in the context of the awareness that civilizations rise and fall. Why did they fall, and what can we do about it today? These authors have provided the tools for a larger understanding, that you must have a purpose, and you must have a belief in a higher power, if you are to break out of mere mundanity. In Volume 1, they provide many keys for re-embracing our tribal roots, including protecting our own tribes, as everyone automatically did at one time. Basics of fighting and defense skills are presented — such as the Lucky Seven,– and how to use your walking stick as the tool it is.